Slow cookers can be amazing for providing a home-cooked meal on those days that your schedule is packed to the brim. They are so easy to set and forget, but how can you be sure you are taking the best care of your slow cooker? After all, proper care will ensure many more yummy meals to come. 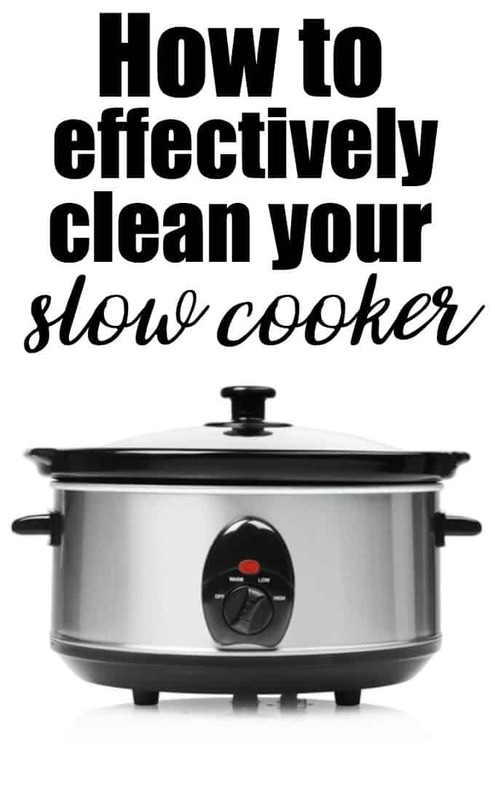 Take a look below at how to effectively clean your slow cooker so you can make sure it lasts for years to come! 1. Don’t let food sit. Once you have eaten your meal, take the time to clean out the insert. The longer you let food sit, the harder it will be to clean. Immediately place leftovers in containers and rinse out the inside of the container to loosen any stuck on food. 2. Never submerge the outer portion. The outer portion of the slow cooker should never be submerged in water. To clean it take a damp cloth and some dish soap and gently wipe clean. You can then take another cloth dipped in only water to rinse clean. Should you encounter stubborn food messes, you can use a Mr. Clean Eraser or scouring pad to buff away the mess. Always unplug your outside shell prior to washing. 3. Clean the insert separately. Most inside compartments are dishwasher-safe. If sink washing, use a grease-fighting dish soap and hot water. Scrub by hand to make sure all of the food particles are loosened and come off. 4. Be gentle with the lid. Rust often occurs on the hardware that is attached to the lid so you want to keep an eye on this and prevent it from happening. Placing the lid in the dishwasher can loosen the hardware that keeps the handle in place. Instead, wash the lid of your slow cooker by hand. This will prevent breakage and rusting. Just use a grease-fighting dish soap and a damp cloth to wipe clean. 5. Use a liner if needed. For exceptionally messy foods or if you know you won’t be able to clean the slow cooker right after serving, use a liner. These liners are made to fit the inside of the slow cooker and will protect it from any food messes. When you are done eating, just remove the liner and the inside of the slow cooker will be spotless. You can find these liners at most retail stores in the food wrap section. 6. Know when the slow cooker is beyond repair. It is always important to keep an eye on the condition of your slow cooker. Since they are often running during the day when no one is home, you want them to be in safe working condition. Don’t use a slow cooker that has a short, or has any frays in the cord. If you smell a burning smell or any chemical or unusual smells, do not use it. Once buttons start to malfunction or dials no longer work smoothly, go ahead and toss the slow cooker out and treat yourself to a new one. Do you have any cleaning tips to add? I do a deep clean with baking soda and vinegar (with water) in my slow cooker about once every couple weeks to a month depending on how much I’ve used it. I have hard water, too, so this helps get rid of the white residue the water leaves from the dishwasher. It also gets rid of any leftover odors. I didn’t know that you could get liners for a slow cooker, that is handy to know. I guess I’m lucky, the slow cooker I inherited from my daughter when she got a new one, has an all glass lid so nothing to rust there and it goes straight into the dishwasher just like the pot itself. Wow! There are slow cooker liners? This could change my life! lol! I’ve been using the liners for so long and LOVE them!!!!!!! I use my crockpot at least twice a week! Love the liners you an buy for them, use them all the time. Make clean up a breeze! i appreciate this article. i am thinking about making craft and def need tips on how to clean slow cooker after i am finished . Thanks for the tips; was not aware of liners. These are great tips. I never knew that most inserts are dishwasher safe. If I get a bit of baked on food stuck on the liner insert, I use a bit of baking soda along with my dish soap to help make it easier to scrub clean.